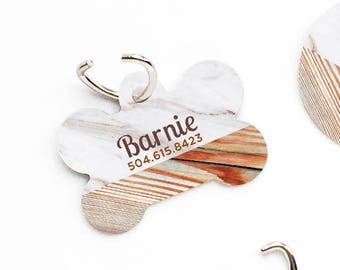 Pet ID Tag Custom Pet Tag Personalized Dog Tag Wood Marble Print Pet Tag Dog ID Tag Wood Print Pet Tag Puppy Tag Dog ID Pet Tag 120. 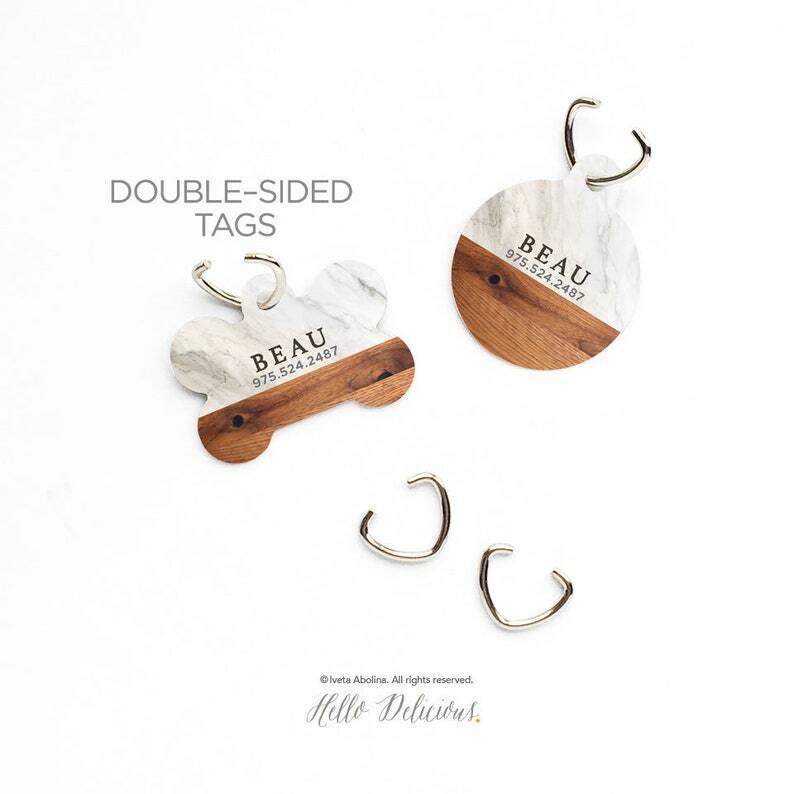 Be Unique with Hello Delicious original design ONE-SIDED or DOUBLE-SIDED pet tags! 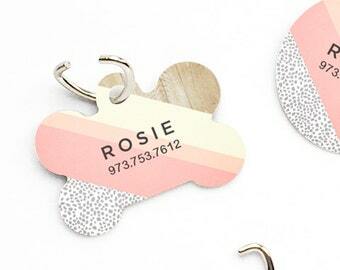 Perfect for your furry friends as an accessory & identification. Comes with a jump ring for attaching to your dog's collar. 3. We can add maximum of 3 lines of text on one side. If you wish to add your address, please keep it super short. 4. 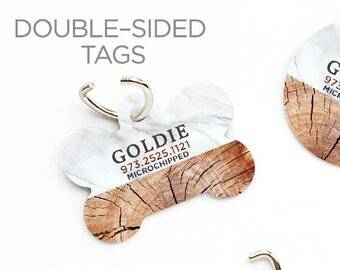 For the double-sided tags please specify info for both sides - FRONT and BACK. IMPORTANT NOTE: We’ll print your info exactly as shown in our listing, unless you specifically ask for a custom stylized wording/text in a separate conversation. Proofs are available upon request. The artwork is printed using heat activated sublimation inks on high gloss aluminum finish material. Back side for the one-sided tag is brushed aluminum color. We are very obsessed with color perfection and try our best to reproduce exact same colors. Sometimes color might differ due to different monitor settings. These are custom made tags, please allow up to 3 days for production. Your order will ship within 4 to 5 business days USPS First Class Mail service. Copyright © 2007 - 2018 Onesweetorange, LLC. All rights reserved. 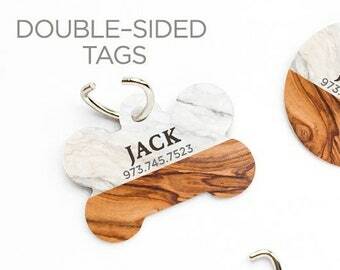 Pet ID Tag Custom Pet Tag Personalized Dog Tag Wood Marble Print Pet Tag Dog ID Tag Wood Print Pet Tag Puppy Tag Dog ID Pet Tag 147. 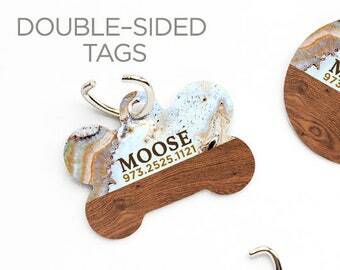 Pet ID Tag Custom Pet Tag Personalized Dog Tag Wood Marble Print Pet Tag Dog ID Tag Wood Print Pet Tag Puppy Tag Dog ID Pet Tag 146. 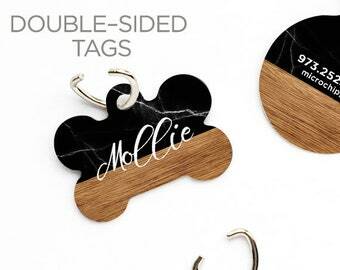 Pet ID Tag Custom Pet Tag Personalized Dog Tag Wood Marble Print Pet Tag Dog ID Tag Wood Print Pet Tag Puppy Tag Dog ID Pet Tag 224. 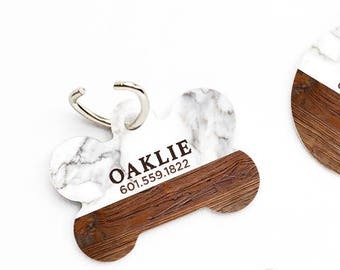 Pet ID Tag Custom Pet Tag Personalized Dog Tag Wood Marble Print Pet Tag Dog ID Tag Wood Print Pet Tag Puppy Tag Dog ID Pet Tag 225. 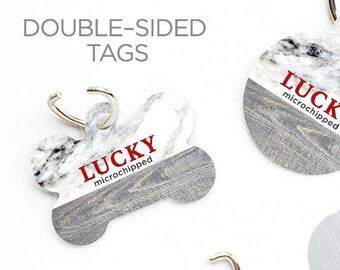 Dog Tag Pet ID Tag Custom Pet Tag Personalized Dog Tag Wood Marble Print Pet Tag Dog ID Tag Wood Print Pet Tag Puppy Tag Dog ID Pet Tag 159. 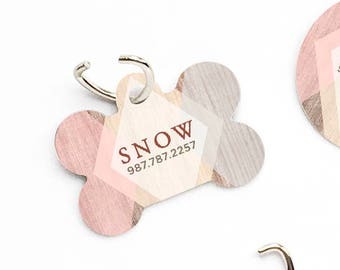 Double-Sided Dog Tag Custom Pet Tag Personalized Dog Tag Wood Marble Print Pet Tag Dog ID Tag Small Pet Tag Puppy Tag Dog ID Pet Tag 188. 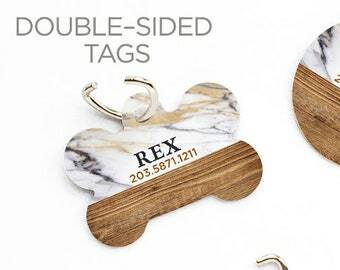 Pet ID Tag Custom Pet Tag Personalized Dog Tag Wood Marble Print Pet Tag Dog ID Tag Wood Print Pet Tag Puppy Tag Dog ID Pet Tag 290. 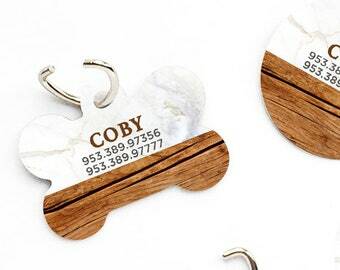 Dog Tag Pet ID Tag Custom Pet Tag Personalized Dog Tag Wood Marble Print Pet Tag Dog ID Tag Wood Print Pet Tag Puppy Tag Dog ID Pet Tag 160. I absolutely love this dog tag! It’s so cute and is a great size for my 8lbs Morkie. Thank you so much for this great product!! The cutest little name tag for our best pal. Looks great and durable! We DO NOT offer any returns or exchanges on personalized or customized items. We will ship the item within 3 to 4 business days after receiving payment with USPS First Class Mail service. We will notify the buyer after shipping via email. Are HelloDelicious products available for wholesale? Yes, we are happy to work with retailers! Please note, HelloDelicious products are not offered on a consignment basis. Please contact us for wholesale information. Can I grab HelloDelicious designs and apply to my product line? No! All our designs are copyrighted and protected. Do not use any of our imagery without our permission. Can I use HelloDelicious designs and post on my blog? 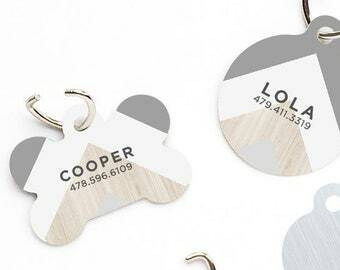 Dog Tag Pet ID Tag Custom Pet Tag Personalized Dog Tag Wood Marble Print Pet Tag Dog ID Tag Wood Print Pet Tag Puppy Tag Dog ID Pet Tag 257. 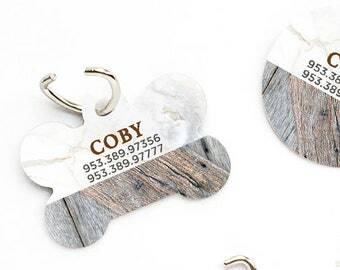 Pet ID Tag Custom Pet Tag Personalized Dog Tag Wood Marble Print Pet Tag Dog ID Tag Wood Print Pet Tag Puppy Tag Dog ID Pet Tag 195. Dog ID Tag Custom Pet Tag Personalized Small Dog Tag Wood Chevron Pet Tag Dog ID Tag Wood Print Pet Tag Puppy Tag Dog ID Pet Tag 143. 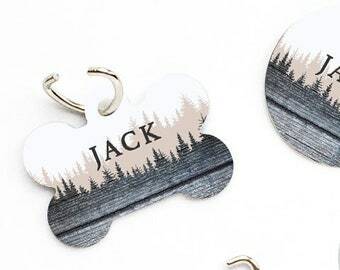 Forest Dog Tag Pet ID Tag Custom Pet Tag Personalized Dog Tag Wood Print Pet Tag Dog ID Tag Holiday Pet Tag Puppy Tag Dog ID Pet Tag 259. 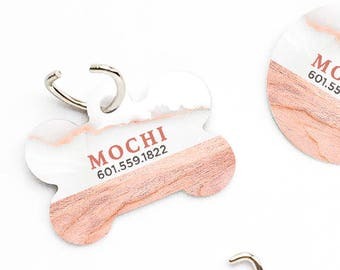 Pet ID Tag Custom Pet Tag Small Dog Personalized Dog Tag Wood Marble Print Pet Tag Dog ID Tag Wood Pet Tag Puppy Tag Dog ID Pet Tag 133.